Oh yay! It’s November! It’s time that I get to post my gratitudes every day! Gratitude is a big part of my life. I did 365 Days of Gratitude in 2014 and I was interviewed about it by the lovely Hannah. Every November, I take the time to photograph and post one thing for which I’m grateful. I’m pretty sure this is my fourth year practicing gratitude in the month of November. I know that it’s important to me to begin to slow down at this time of year. September and October are both busy, hectic, loud months with school starting, routines being developed, Halloween excitement, all that. In November, we begin to pause, we begin to quiet down. We get ready for Advent and the meditation and introspection that comes with that season of preparation. It gets darker and darker as the days get shorter and shorter. Nature starts to shut down and pack up for the winter. November is just a natural time to turn inside and give thanks for those things that surround us. So, please join me in giving thanks for the month of November. 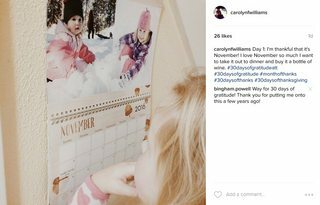 There are so many hashtags on Instagram that point to gratitude, but the ones I use the most are #30daysofgratitude to be part of the larger community of gratitude, but I also like to do my own #30daysofgratitudeATT (for And Then They…) so I can keep track of my, and my friends’ posts more easily. So, if you post some gratitude posts this month (there are no rules saying you have to do it every single day), please add those hashtags so we can all follow along with each others’ months of gratitude. 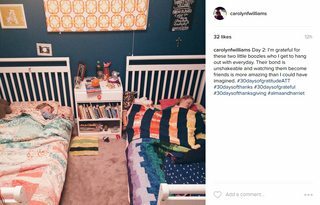 I’m carolynfwilliams on Instagram if you want to follow along.